In March 1985, the Tennessee Valley Authority (TVA) “voluntarily” shut down all three reactors at the Browns Ferry nuclear plant in Alabama. Around the same time, TVA “voluntarily” shut down both reactors at the Sequoyah nuclear plant in Tennessee. Why did TVA “voluntarily” shut down five nuclear reactors? Because TVA only operated five nuclear reactors at the time. 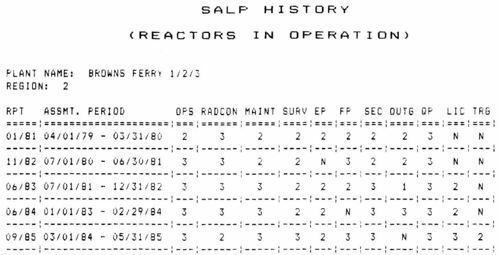 TVA’s safety record at that time was abysmal.Figure 1 shows the NRC’s ratings under its old Systematic Assessment of Licensee Performance (SALP) for Browns Ferry for the five evaluation periods leading up to the March 1985 shut downs. The SALP ratings ranged from 1 for excellent performance to 3 for poor performance. In the last evaluation period, Browns Ferry received ratings of 3 for Operations (OPS), Maintenance (MAINT), Surveillance testing (SURV), Fire Protection (FP), Security (SEC), Quality Programs (QP), and Licensing (LIC). Faced with sub-par performance in 7 of the 10 categories rated by the NRC, TVA volunteered to shut down all three reactors at Browns Ferry and undertake the necessary reforms. Figure 1: Systematic Assessment of Licensee Performance (SALP) ratings for Browns Ferry for the five evaluation periods leading up to the March 1985 shut downs. The reforms took awhile. Browns Ferry Unit 2 did not restart until May 1991—6 years later—while Unit 3 did not restart until November 1995—more than a decade later. The six-plus year outage on Unit 2 and the ten-plus year outage for Unit 3 were eclipsed collectively by the 21-plus year outage on Unit 1. TVA restarted Unit 1 in February 2007 after nearly a 22 year outage. Less than five years after waking from its two decades long nap, Browns Ferry Unit 1 returned to its old bad habits. Unit 1 is currently the poorest performing reactor in the entire United States per the NRC’s most recent ratings (see Figure 2). 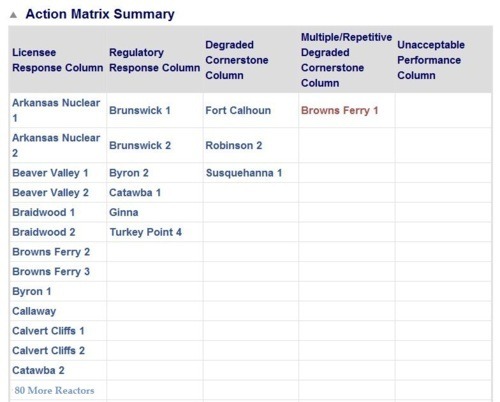 Why are there 103 reactors performing better than Browns Ferry Unit 1? Because there are only 104 reactors operating in the country. In March 1985, a new NRC regulation went into effect to ensure that safety equipment exposed to harsh environments during an accident would continue to function under such conditions. When the NRC notified TVA that its Sequoyah plant was going to receive one of the first audits under these new requirements, TVA hired an independent company to pre-audit Sequoyah. The pre-audit results were so bad that TVA voluntarily shut down both Sequoyah reactors in August 1985 to correct the problems. The problems were so severe that Sequoyah 1 remained shut down for more than 3 years, and Sequoyah 2 was shut down for 2.7 years. And then, only four and a half years later, Sequoyah 1 again shut down for more than a year. There’s an old joke about someone being unable to walk and chew gum at the same time. TVA may embody the corporate version of that adage. In the mid 1980s, TVA tried to operate five reactors while attempting to build four others (two at Watts Bar and two at Bellefonte). Managing such large and diverse challenges proved too much for TVA and its nuclear program crashed to a halt. Today, TVA tries to operate six reactors (Watts Bar Unit1 having joined the fleet in late 1995) while attempting to build several others (Watts Bar Unit 2, Bellefonte Unit 1, and rumors of new reactors at Bellefonte and Clinch River). As in the mid 1980s, there are signs that TVA once again has too many balls up in the air and is dropping some. The wheels on TVA’s nuclear wagon are clearly wobbling. If TVA doesn’t take immediate steps to correct its performance shortcomings, it’s only a matter of time before the wheels fall off and the nuclear program grinds to another halt.